The Applied Biosystems StepOnePlus is a real-time PCR system designed to meet your needs. These 96 well real-time PCR systems offers four color optical recording allowing for faster measurement. Paired up with the software the StepOnePlus is capable of collecting melting curve data for High Resolution Melt also known as HRM. This easy to use instrument comes with a built-in LCD touchscreen controllers allowing you to preconfigure experiments and save them in the system internal memory bank. The StepOnePlus Real-Time PCR engineered by Life technologies originally owned by Applied Biosystems (now owned by Thermo Scientific) uses a long lasting LED lighting system which has the ability to record fluorescence from SYBR Green, VIC/JOE, NED/TAMRA, FAM and works well with ROX dyes. This Real-Time PCR is extremely energy efficient and takes up minimal bench space making an ideal fit for labs who are battling for space. The StepOne Plus Real-Time PCR comes with a built-in protocol wizard to help new users set up assays in a timely fashion and can run the full range of TaqMan assays. This Real-Time PCR has a 99.7% accuracy with TaqMan and distinguishes populations of 5,000 and 10,000 template copies. The StepOnePlus is a next generation Real-Time PCR built off the ever popular ABI 7500 qPCR and now the new ABI ViiA 7 technology, is a cost effective way to run a 4-color 96 well system for a fraction off the cost. 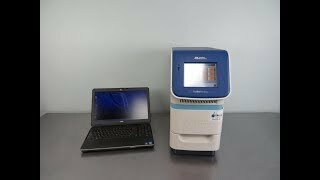 Real Time PCR also called quantitative real time polymerase chain reaction (qPCR) is a technique based on PCR, which is used to amplify and at the same time quantify a targeted DNA molecule. The StepOnePlus Real-Time PCR can be used one or more specific sequences in a DNA sample, Real Time-PCR enables both detection and quantification. The quantity can be either an absolute number of copies or a relative amount when normalized to DNA input or additional normalizing genes. This system delivers real-time PCR technology to a whole new level. The Applied Biosystems software homepage allows you to easily navigate from one place to the next covering all phases of the Real-Time PCR process including fluorescence detection, thermal cycling and reaction set up. The ABI StepOnePlus Real-Time PCR is a great system for scientists looking to take their genetic analysis research to the next level. The software comes with preloaded protocols needed to run specific applications while using Applied Biosystems Reagents. Setup takes less five minutes and you can insert your plate and go. The Applied Biosystems Real-Time PCR software runs off of Windows XP platform and even works with Windows 7. The StepOnePlus can even assist you with selecting and ordering PCR reagents needed to run your experiment. This Real-Time PCR has a temperature range of 4° to 100°C, accommodates 96 well plates, 0.1ml tubes and 8 tube PCR strips. Dyes for the StepOnePlus can be purchased directly from Applied Biosystems, or Thermo Scientific and other third party vendors. The system works well for Gene Detection and Gene Expression Profiling. Contact us today to learn more about our ABI StepOnePlus Real-Time PCR. The StepOnePlus Real-Time PCR used for quantitative measurement was tested by our team and is performing well at factory specifications. All of our lab equipment comes backed with our standard warranty. Should you have any questions, please don't hesitate to contact us.